Here’s an audio poem. Click on the link to listen. Will Nixon’s Acrostic Woodstock, published through he and fellow poet/flaneur Michael Perkins’ Bushwhack Books comes from one of those self-dares that have a way of freeing up one’s creativity from past triumphs. 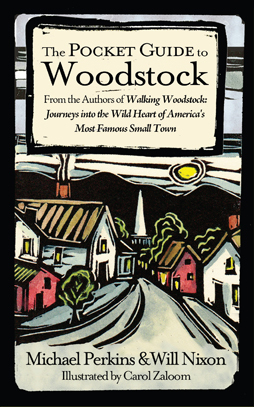 It’s focus is tight: each work captures another aspect of the town he’s become such a part of, Woodstock (and many of the poems have appeared in this paper). 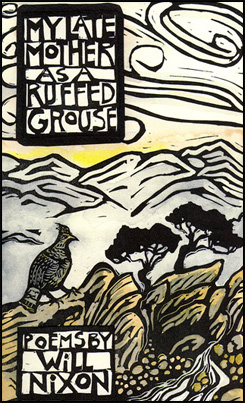 The style is simple on the surface: those acrostics were each line starts with one of the letters of the poem’s title. Within that universe, though, Nixon explores worlds of rhythms, stylistic flourishes, witticisms and deep understandings of both the inner and outer worlds he (and all of us) inhabit. Heather, the nurse, who had such a way with a needle? 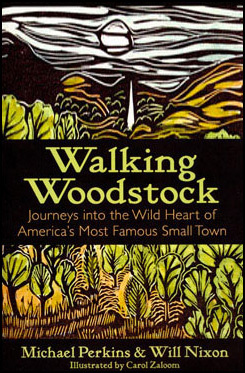 We expect this to become a big seller this season, and all that follow, as he and Perkins’ Walking Woodstock: Journeys into the Wild Heart of America’s Most Famous Small Town, especially given the wealth of subjects, and truly local references (including some great notes at the book’s end), it includes. Hungry for light, Ice Boy pushes his head up through frozen soil, into the field of snow. Newborn among cornstalk stubble, he glitters like a sapphire. Water gurgles through his veins. As his crystalline carapace melts, he sighs with a voice between harmonica and bell. He will be beautiful, falling as silver rain onto the distant ocean. He will taste like sugar to mountain children, who will catch his feathers on their tongues. To be honest, I felt slightly intimidated, if not envious of Chris’s imagination that drew verbal portraits with a Rembrandt-like brilliance that made my own efforts at Surrealism seem cartoonish. In person, however, she’s hardly Gothic or gloomy. She’s hardly and friendly, an independent woman who follows her curiosity. We’d met at a poetry reading, but I’d gotten to know her better through her blog about nature walks, including many at Ward Pound Ridge Reservation, her sanctuary in Westchester. She posted nature photographs–she had a good eye, especially for patterns in bark or ice that suggested secretive symbols–and she added a line or two from a poem like a benediction to the moment that she’d captured with her camera. I loved her talent for matching lines to a scene. For all the poetry that I’ve read, I can never recall useful lines at opportune moments. My reading got left behind in books. She brought hers into the field to enrich her experiences. Before moving to Rhinebeck, Chris had called to ask about the area. A big concern was leaving behind Ward Pound Ridge Reservation with its miles of trails and secluded spots that she’d come to think of as her refuge. I’d warned her that we didn’t have any parks quite like Ward Pound Ridge, but after settling in Rhinebeck, she’d found her way to the former estate properties converted to parks along the Hudson, where she’d established new sanctuaries for herself. On an autumn afternoon, she led me to her favorite, a pocket cove below Mills Mansion. The stony beach had a calendar-worthy view of a bay in the river that looked like a lake. On the far side stood the Esopus Meadows Lighthouse, a cozy white house almost too big for its tiny rock island. The rising humps of the Catskills dominated the horizon. Though near the trail, the cove felt secluded, a gray pebble beach between slick slabs of bedrock. Two fallen tree trunks hogged the beach, perhaps blocking some people from walking down to the water, a gentle lapping on this calm afternoon. Earlier in the summer, Chris had begun beach combing in this s pot, an activity reminiscent of childhood vacations in Maine. She found glass nuggets and ceramic chips washed up among the pebbles, which, themselves, included many odd fusions of smooth gray stone and rough white quartz that she dubbed “tooth rocks” because they resembled molars from the mouths of giants with poor dental hygiene. Pleased by her discoveries, she laid her exotic collection of pebbles and nuggets in a snake-like pattern atop one of the logs, and thus a tradition was born. Several days later, she returned to find that many of her pieces had been taken, which pleased her further that strangers had appreciated her little treasures. She assembled another sculpture from her beach combings, and in time developed a routine of returning to cove to lay out patterns of snakes or grids or swirls that might include bones, feathers, driftwood, or anything else that had washed up on the beach. The tides always brought fresh discoveries. On my visit I saw two newly made sculptures. A split along the length of one fallen trunk held a row of wedged-in arrowhead-like rocks for what she thought of as a miniature Stonehenge. The wider log held a row of bright pebbles and green glass nuggets like a bejeweled snake. Though small, her pieces left no doubt that a person had enjoyed making art as our species has done for thousands of years. A friend compared her to Johnny Appleseed, which is fitting, since these quotes are meant to be seeds that plant themselves in the woodsy musings of whomever finds them by the shoreline. One woman Chris met at the cove asked if she might send the quote to her daughter in the Peace Corps in Africa. Another, who’d recently lost her husband, had found Chris’s gift of a small glass oval engraved with the word “Halcyon,” which refers not only to golden serenity, as in Halcyon Days, but to kingfishers thanks to a Greek myth. Upon hearing that her beloved had died in a shipwreck, Alcyon had thrown herself into the sea in grief. Taking pity, the gods resurrected both of them as kingfishers. The Halcyon Days of Winter referred to the seven days without storms that the gods permitted her to nest on the beach. The recently widowed woman took this fable to heart because her husband had been a fisherman. Chris treasures these synchronicities created by her practices at the cove. She has tucked a guest book and a waterproof pen into a tree hollow for others to write their own little notes and poems. She quickly found me a tooth rock among the beach pebbles as a gift for my visit, then got back to work on her log snake. For a moment I felt awkward, as if play time was meant for children rather than for adults, but as soon as I pulled out my sharpie I slipped into the spirit of our visit. I intended to write the Langston Hughes poem on leaves, so I gathered several yellow basswood leaves from the ground. They offered plenty of room to print “I’ve known rivers” and more when I used the leaf veins as notebook lines, but the overall effect was underwhelming: bad handwriting on dirty leaves. My image of leaves as little poetry flags had looked better in my mind’s eye. So I decided to launch them into the river as poetry boats. At the nearby point I stood on a boulder that rose straight out of the clear choppy water. Ten feet out in the current other leaves floated away from the shoreline at a steady clip. Who knew how far my leaf might travel like a message in a bottle? Alas, my first toss didn’t even reach the water. The leaf got snagged by cedar tree branches crowding the nose of my rock. My second landed in the water, but upside down and too close to shore to join the others exiting the cove on a current. Mine got stuck in an eddy and sank several inches to flop around like a drunken flounder. Thankfully, I had a better idea. Faded orange survey tape tied to a shrub sapling offered two loose ends dangling like a skinny tie. The shorter strip was the right length to print “I’ve known rivers.” The longer held “My soul has grown deep like the rivers.” The black ink made a bold statement on the orange tape for the perfect poetry banner. I was delighted, so I didn’t stop. There was another tape tied to a cedar trunk like an undone bow tie. A row of tapes marking trees in a straight line led me up the hillside. I must have graffitied eight or ten before I finished, every one I could find. Perhaps I shouldn’t have been marking up survey tags, but slipping poetry into public view always feels like a triumph. People enjoy reading poetry on subways posters; why not in the woods? In fact, why not invent orange poetry tape to offset the yellow caution tape that appears all too often in our lives? Wouldn’t we rather find inspiration? I’ve know rivers ancient as the world and older than the flow of human blood in human veins. I heard the singing of the Mississippi when Abe Lincoln when down to New Orleans, and I’ve seen its muddy bosom turn all golden in the sunset. By some measures, not very much. I wasn’t a river lover like Chris with her beach combing or like many others with their sailing or kayaking or even their dog walking that brought them down to the shoreline. I was a hiker who’d moved twenty years earlier to the Catskills to live in a cabin and climb the mountains. Rarely had I ventured down to the Hudson, viewing it primarily from the scenic remove of the Kingston-Rhinecliff Bridge, not the kind of intimate encounter needed to claim a place as your own. Yet I could see the value of Chris’s river. Mountains may have molded my character, stubborn and triumphant over the valleys below. Yet the river offered what I now needed to learn with its flux and its flow. A mountain is to be conquered. A river is accepted. Back home I placed Chris’s gift, my tooth rock, on my desk as a reminder to befriend the Hudson. It waits like the kernel of a poem yet to be written. 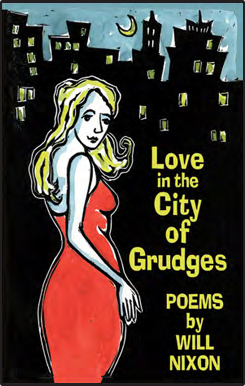 For over a decade, I have been writing most of my poems on walks. They generally tend to be short poems, often sonnets, given the limitations of time this method imposes. I write on folded squares of blank paper that I carry in my pockets, pausing briefly each time I need to write a line down, and subsequently pausing again to reread and revise. Later, I will type the poem on my computer and make further revisions. I mostly write nature poetry, so the locale for my “poetry walks” is of crucial significance. I view the locale where I walk as a kind of collaborator with me on these poems, often providing an inspiration or catalyst in the form of some quirk of nature that gives me an image or an idea. My poetry walk nowadays is often one through the outskirts of Woodstock, along a combination of Lower and Upper Byrdcliffe Roads. A recent experience in which my walk seemed to co-author a poem involved the beautiful blue flower, chicory. I do not have even the lay person’s knowledge of flowers (that I may have of birds and trees), and I had not noticed this flower, which is common along a section of Rock City Road and Lower Byrdcliffe Road, previously. One day, fascinated as ever by the role that math plays in nature, I happened to pause before one, stoop, and count how many petals it had. Nineteen. Wondering what the genetic history might have been that led to this particular number, I went on to count several others. Fourteen petals. Seventeen. Fifteen. There was no exact replication of number from one to the next, rather a range from the low to high teens. I puzzled over it. Barring accident or disease, humans go through life with two arms and two legs, not a combination that might add up to five in this person, three in the next, etc. So I wondered about a genetic narrative that provided only a range for petals. This was obviously not the sophisticated questioning of an evolutionary biologist, and maybe petals shouldn’t really be compared to limbs, but I’m a poet, not a scientist. And my bafflement inspired two poems. Before concluding with the poems, I should mention one or two additional catalysts for them. Beyond observation of nature I am as mentioned above concerned with the role that math plays in nature, and toward that end have chosen a poetic and historical alter ego for myself, the Greek philosopher Pythagoras. I’ve published two collections from Pythagoras’s imagined point of view, Pythagoras in Love and Logician of the Wind, and have continued to write and publish poems from Pythagoras’s point of view. That’s how I came in the first poem to transform my experience with the chicory into a dilemma that might have startled Pythagoras two thousand, five hundred years ago. I fictionalized my observation for this poem, because the poem grew too complicated and unwieldy otherwise. The second poem, a triolet, was truthful to my observation but did not involve Pythagoras. he thinks, seems awfully random. Odd. And prime. Thoughts drift off slowly. Black clouds in the west. A flock of thirteen birds. Lightning. No rest. thirteen to nineteen, composite or prime. This flower loves math more than you or me! it loves to count, like timber wolves to roam. How does a writer sit alone for hours? Sometimes I light a candle for comfort. Choosing a new one at Candlestock is like choosing a new friend. An altar for a single pure thought. Drips draw rough spines down the wax sides. Elope with the curtains, but not tonight. Scholars have written scrolls by candlelight. Trappists have chosen its truth over revolutions. Knuckle of flame is our key. My mind wanders over latté. Here’s what occurred to me one afternoon at Bread Alone. Doom gives crunch to the oatmeal. English breakfast with your mother’s marmalade. CVS originally stood for Consumer Value Stores. Started in Lowell, Massachusetts in 1963, the chain reached Woodstock in 2001, generating controversy by replacing the town’s last supermarket. “Food, Not Drugs,” said one picket sign. “Community Need, Not Corporate Greed,” said another. Explaining the outrage, supervisor Jeremy Wilber told the New York Times, “Woodstock cannot be crucified on the cross of CVS.” But the pharmacy opened, and life went on. My dear friend and Walking Woodstock co-author, Michael Perkins, has been afflicted with Parkinson’s for some time. In our first years of walking together, I didn’t even know of his aliment. Then he fell and dislocated his shoulder within sight of Kaaterskill Falls, a terrible accident, and I became aware of what he faced. Since then, the disease has taken a crippling toll. Michael hasn’t been able to join me for a Woodstock walk for several years now. I find it heartbreaking to see him hobbled over, yet I also believe that he’s teaching me an invaluable lesson about the human spirit in the way he has handled this curse with such dignity and fortitude. I expressed my feelings in a prose poem that the 92nd Street Y in Manhattan has now published in its web magazine. I share it in honor of Michael. He does his walking in the kitchen now. His little box of tricks, a silver snap case of pills in chalk and orange, now plays its own tricks. But his mind hasn’t aged a day in years. He pins his latest aphorisms to the fridge. Parkinson’s is the raging monkey wildly shaking his simian arms to get out of this tree, or refusing to live in this zoo and freezing up in a pout. We prefer to talk about library politics. Last week he fell for no reason. The bruise beside his eye is as green as the Gowanus canal, not that we have any reason to think of the Gowanus canal. No coffee this morning, but he has orange juice to offer. He manages the carton from the fridge to the counter, but his step becomes a stumble that is life on his feet. He grips the counter for a railing, holds forth the glass. The orange juice is a choppy sea. I drink it like medicine. Something else keeps us alive. Please don’t let the dog out. Really I wish the dog would come back. Easter isn’t my favorite holiday. Saturday I plan to do nothing. Writing prompts have become my secret weapon. Here’s one from Twyla Tharp’s book, The Creative Habit: Learn It And Use It For Life. purple fish with kissy lips & parrots tough as oven mitts. the tank. We’re cheap flirts preying on your cuddly desires. of your teddy bear. Real love spreads you thin across the ice. Will Nixon grew up in the Connecticut suburbs, spent his young adulthood in Hoboken and Manhattan, then moved to a Catskills log cabin in 1996 complete with a wood stove and mice. For years, he wrote environmental journalism, then turned to poetry and personal essays. His work has been nominated for a Pushcart Prize and listed in Best American Essays 2004. He now lives in Woodstock, NY with a wall thermostat for heat, but still can't get rid of the mice.